Sylvia Plath was born in Boston, MA, on October 27, 1932. She had one older brother who was born in 1936, which is when the family moved to Winthrop, Massachusetts. At eight years old, Plath already had an interest in writing. She submitted a poem to the Boston Herald and they ended up publishing it in their children’s section. Plath’s father passed away just over a week after that due to amputation of his foot from diabetes. Sylvia’s mother moved her and her brother to Wellesley, Massachusetts, in 1942, which is where she attended Bradford Senior High School until 1950. Plath decided to become a student at Smith College, which is where she made a lot of writing connections and was able to become a guest editor in New York City. Unfortunately her New York experience did not go as she anticipated, and this led her to go on a downward spiral towards suicide. Plath ended up getting electroconvulsive therapy for her depression, but she still attempted suicide in August of 1953. This attempt was not successful and Plath ended up living in psychiatric care for the next six months. The time spent at the hospital proved to be very difficult, as she received shock treatment and many other treatments that were difficult for her to go through. Her recovery was successful and she was able to go back to college. After writing her first thesis, she received high honors from her college and was able to graduate at the head of her class. This resulted in her being awarded the Fulbright Scholarship, which she used to attend Newnham College in Cambridge, England. During Sylvia’s time at this college, she wrote for the school’s newspaper and wrote poetry that reflected her life experiences. While in Cambridge, she also met Ted Hughes, who later became her husband on June 15, 1956. 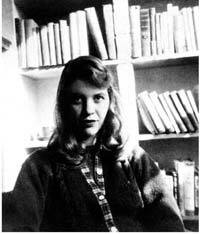 In 1958 they moved to Boston, MA and Plath got a position working in the psychiatric unit of the local hospital. She continued to write during this time and spoke often about her depression and previous suicide attempts. Plath separated from her husband in 1962 after finding out that he was having an affair. This resulted in her having a lot of creativity and writing numerous poems before moving to London in 1962. However, the winter of 1962 was extremely cold and Sylvia’s kids got sick often. This triggered her depression, but she continued to write and ended up finishing her collection of poems. Plath was able to get prescription antidepressants from a friend, but these did not work for her. She ended up committing suicide on February 11, 1963, with carbon-monoxide poisoning from her oven. She has a gravestone at Heptonstall Church in West Yorkshire. Collected Poems was published in 1981 and she won the Pulitzer Prize, which was the first given to a deceased poet. Many more works that she created have been discovered since her death, but many of them were never published. The movie Sylvia was released in 2003 and was a portrayal of her life.